The WFPI is collaborating with Médecins sans Frontières/Doctors without Borders (MSF) to provide pediatric imaging telereporters to support MSF’s global telemedicine network, using platforms and technology already set up in project sites. See this MSF video explaining how the system works, "bringing some of the best medicine to some of the worst off patients in the world". A rising number of WFPI volunteers are enlisted on the Collegium Telemedicus platform to tele-read for MSF, including Drs. Savvas Andronikou, Michelle Fink, Karen Checuti, Keiran McHugh and Anne Geoffray. Our TB "hotline" group is about to join the team as MSF tele-reading expands. The flow of pediatric cases originating from all over the world has now reached the hundreds with subsequent exchange occurring on some. The platform works well, though the quality of images referred is highly variable. 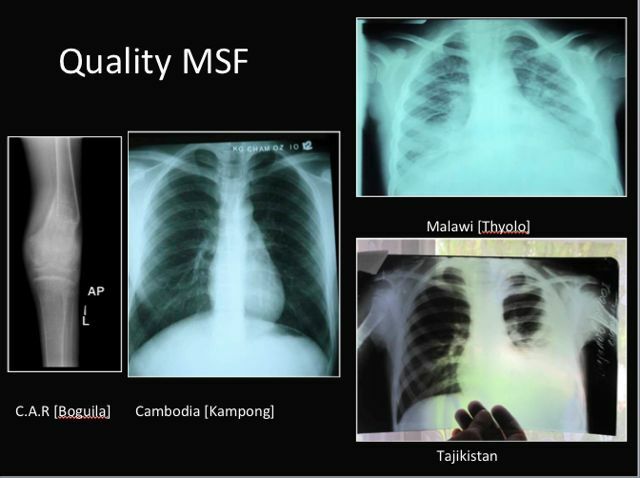 See WFPI's mini-symposium, "Outreach in the Developing World" and our list of telemedicine literature here for articles on MSF's tele-radiological history and quality assurance/lessons learnt. Discussions are underway with MSF's diagnostic imaging network for expanding WFPI's support. Our strong tuberculosis focus dovetails with MSF's TB drive: see here for MSF's TB overview, associated literature and films. MSF sends doctors to South Africa for HIV training where pediatric imaging sessions have been delivered via WFPI's South African pediatric imaging team. One of WFPI's active volunteers, Savvas Andronikou (former WFPI outreach leader), assists in the production of MSF diagnostic guidelines. He recently co-authored an article on a quality assessment of X-rays interpreted via tele-radiology for MSF, accepted for publication in the Journal of Telemedicine and Telecare. The growing body of MSF-led publications on tele-radiology is available here. Savvas has also led the contributions to MSF's lower resource ultrasound ("Point of Care) manual. Other authors included Drs. Dorothy Bulas, Cicero Silva, Tracy Kilburn and Keiran McHugh. Two "Seven Minute Snippets" (short videos) on the interpretation of pediatric tuberculosis CXR films were co-produced with MSF in South Africa; now incorporated into WFPI's online library here.